Rhin is one of your potential Companions in Torment:Tides of Numenera. She is a lost child who speaks to gods. 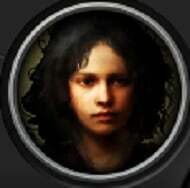 Unlike other companions of Last Castoff, she dont have a class, thus is not very useful in combat. The side quest Beloved Slave leads you to her hideout at Cliff's Edge. After Last Castoff settle the situation between her and slaver Tol Maguur,s he can became a party member. After travel with Rhin for a while, ask him about Ahl, and if Ahl blocked her thoughts so you cannt read award you 25 XP. Aen-tozen at Little Nihliesh can send Rhin to her homeworld. Rhin will left you a gift -- God of Finding. Rhin will rejoin your team at The Calm after the Resonance is activited, as a grown woman, if you sent her home. Walks Between: Rhin has crossed worlds to return to you at your time of need. Her old gods are with her and stronger than ever. She seem to have brought new gods as well.